Six Russian sailors have been kidnapped after their vessel was attacked by pirates whilst sailing off the coast of Benin. The attack occurred on 1 January, according to the Russian Agency for Maritime and River Transport (Rosmorrechflot). It said seven to nine armed pirates boarded the Panama-flagged MSC Mandy at night and raided the ship before taking six sailors hostage. These (captain, senior assistant captain, 3rd mate, boatswain, fitter and cook) are all Russian. None of the remaining 18 crewmembers (comprising Russians and Ukrainians) were injured. Russian diplomats in Nigeria and Benin are working to release the captured sailors, RIA Novosti reported. Pirate activity continues in the Gulf of Guinea, with dozens of seafarers kidnapped in 2018 and dozens of vessels attacked. For instance, according to the International Maritime Bureau’s Piracy Reporting Centre, on 14 December seven armed pirates in a speed boat approached and fired upon a chemical tanker underway off Nigeria. The onboard armed security guard returned fire resulting in the pirates aborting the attack and moving away. Earlier that month, on 4 December, nine pirates in a speedboat chased and successfully boarded a supply vessel underway off Nigeria. All crew mustered in the citadel. 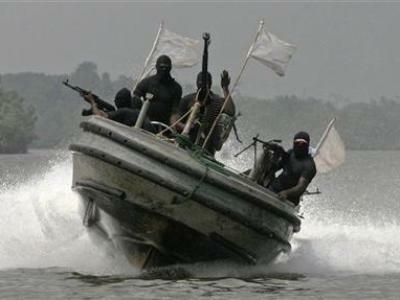 The Nigerian Navy sent a patrol boat to intercept the pirates. Upon arriving to the vessel’s location, the navy opened fire, resulting in the pirates escaping. On 29 October a product tanker was hijacked by pirates whilst carrying out bunkering operations at sea around 100 nautical miles west of Pointe Noire, Republic of the Congo. Armed pirates in a speed boat attacked the vessel, taking hostage the crew members and hijacking the tanker. On2 November, the owners confirmed the tanker was released off Nigeria with eight crewmembers missing. In the first half of 2018, pirates kidnapped 35 seafarers off Nigeria, which is the focus of attacks. According to the EOS Risk Group, from January through June 2018, it recorded 34 Nigerian pirate attacks on merchant and fishing vessels in the Gulf of Guinea. These attacks resulted in the kidnap of 35 seafarers for ransom and the hijacking of several vessels. Jake Longworth, senior intelligence analyst at EOS Risk, said it was concerning that petro-piracy, involving the hijacking of tankers for oil theft, has seen resurgence. Following a decline in piracy activity off Benin since 2012, EOS recorded 7 pirate attacks in the waters of Nigeria’s western neighbour in the first half of 2018. The attacks involved several successful tanker hijackings, one of which resulted in the loss of 2 000 metric tonnes of product. Nigerian pirates also operated in Ghanaian waters in April, kidnapping five seafarers from two vessels. Following the hijacking of the MT Barrett, pirates attacked three other tankers in Cotonou anchorage in February 2018. On 1st February, the Panama-flagged tanker, MT Marine Express, with 22 Indian nationals on board and laden with 13 500 tons of gasoline, was hijacked by around 13 pirates from Cotonou anchorage, Benin. Managers Anglo-Eastern reported that the vessel was released 6 days later, its crew safe and cargo intact. Despite hijackings grabbing the headlines, Longworth said that the main threat is still found off the restive Niger Delta. Pirates operating in these waters are focussed on the kidnap of seafarers for ransom.